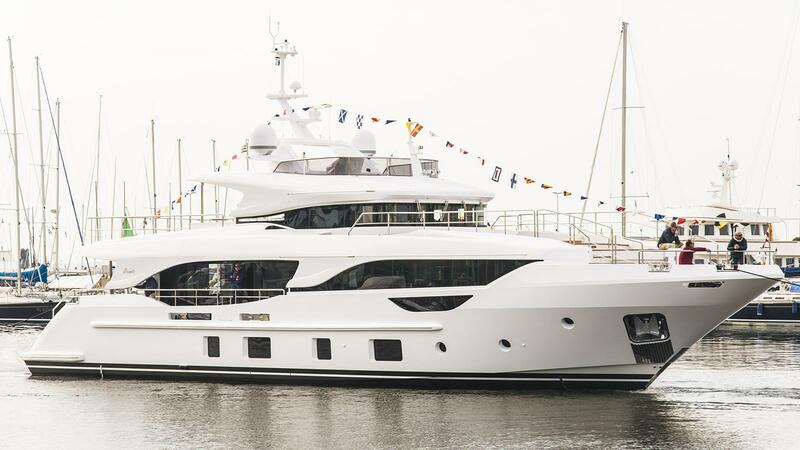 Italian yard Benetti has launched new motor yacht named Uriamir. Accommodation is for up to ten guests split across four cabins, including a main deck owner’s suite, complete with his and hers bathrooms and walk-in wardrobes. Below decks, Uriamir has been fitted with two double cabins and two convertible twin cabins with sliding berths and Pullman bunks. What’s more, the three-cabin crew quarters is suitable for a staff of up to five people. The interior décor has been customised to suit her owner’s preferences, with alternating use of light and dark coloured materials, such as tay and tanganika wood as well as various types of marble. Other key features include a drop-down television in the lounge, a superyacht spa pool on the foredeck and a 4.4 metre tender garage. Power comes from a pair of 1,000hp MAN V8 engines for a top speed of 14.5 knots. When trimmed back to her economic speed of ten knots, Uriamir will boast a cruising range of 2,400 nautical miles, drawing on a total fuel capacity of 20,000 litres. Uriamir will be going on display at the next Versilia Yachting Rendezvous.